WASHINGTON - Nearly all of the insurgents battling US and NATO troops in Afghanistan are not religiously motivated Taliban and Al Qaeda warriors, but a new generation of tribal fighters vying for control of territory, mineral wealth, and smuggling routes, according to summaries of new US intelligence reports. Some of the major insurgent groups, including one responsible for a spate of recent American casualties, actually opposed the Taliban’s harsh Islamic government in Afghanistan during the 1990s, according to the reports, described by US officials under the condition they not be identified. US commanders and politicians often loosely refer to the enemy as the Taliban or Al Qaeda, giving rise to the image of holy warriors seeking to spread a fundamentalist form of Islam. But the mostly ethnic Pashtun fighters are often deeply connected by family and social ties to the valleys and mountains where they are fighting, and they see themselves as opposing the United States be cause it is an occupying power, the officials and analysts said. The nonreligious motivations give American war planners some hope that they can reduce the power of these militias, and perhaps even co-opt their support with a new set of strategies and incentives. The Afghan fighters use the threat of force to further their own economic interests - extorting payments from people shipping goods through the mountains including, in some cases, even US military supplies coming into Afghanistan from Pakistan, the officials said. The new intelligence analyses were requested by military commanders earlier this year with the hopes of identifying who might be open to accommodation. 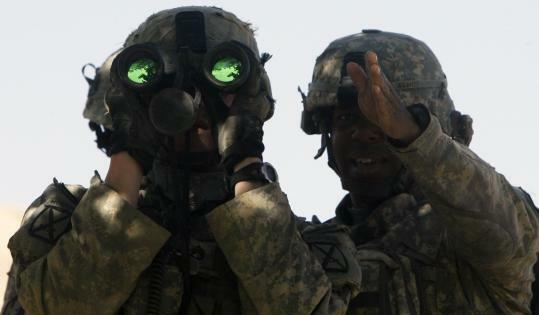 The data are informing the heated debate within the Obama administration on whether to send tens of thousands of additional troops to wage a counterinsurgency campaign in Afghanistan. Robert Gibbs, White House press secretary, indicated yesterday that the makeup of the insurgency is playing a prominent role in the discussions. Indeed, the intelligence reports say the Taliban movement that harbored the Al Qaeda terrorist network before the Sept. 11, 2001, attacks is responsible for only a small share of the rising attacks - mostly in southern Afghanistan, according to the officials. “The term [Taliban] has come to have a meaning far beyond what the United States should care about’’ militarily, said Frederick W. Kagan, a resident scholar at the conservative American Enterprise Institute who is advising US military commanders. The long-term strategy must include an effort by the Afghan government to “reintegrate’’ many insurgents into society, an enormously complex task that requires much greater effort than just more troops, according to government advisers and private specialists. The recent assessment by General Stanley A. McChrystal, the top US commander in Afghanistan, outlined the connections between insurgent groups and the original Taliban leadership that fled to Pakistan. It also raises prospects for reconciliation with some of them. For example, two major insurgent groups are believed to have allied with the Taliban to protect their sphere of influence, not to wage a holy war against the West. The Taliban often help train local militias, but in exchange for loyalty also offer income - including in the form of wives and dowries - to many warlords, said Bruce Hoffman, a professor at Georgetown University who also advises the US government on terrorism and counterinsurgency strategy. “It is economics,’’ Hoffman said. Underneath, however, there is also simply a strong desire to repel foreign invaders, US officials believe, which may be harder to overcome. They are fighting “more out of xenophobia than Islamic fundamentalism,’’ said a defense official with access to the latest intelligence assessments on Afghanistan. The good news, however, is that many of them may be enticed to come over to the other side, said Munoz.